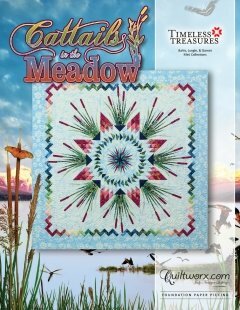 HOME > Judy Niemeyer Quiltworx > Cattails in the Meadow 2018 77" x 77"
Cattails in the Meadow 2018 77" x 77"
The Cattails in the Meadow design was created using a series of mixer blocks from the Cattail Wall Quilt Mixer series designed by Judy and Bradley Niemeyer, from Quiltworx.com. It includes three sections referred to as Groups A, B, and C and these Group sizes have been standardized so that you can use interchangeable blocks in each space. The Units selected for this quilt were named Ribbon Star, Moon Flower, and Star Point Border. If you have purchased this pattern, these groups have been combined into one pattern. This design is also a Collectors Club Design meaning that it will be released in limited numbers and features one of the Tonga Batik mini collections designed by Judy and Judel Niemeyer, with Timeless Treasures. The mini collection featured with this pattern is called Garnet. Mini Collections are small Batik groupings of (8) fabrics in a similar color group ranging from light to dark.